Designed for senior-level and graduate courses in Dynamics of Structures and Earthquake Engineering. 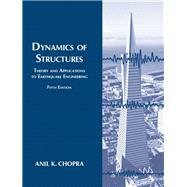 An expert on structural dynamics and earthquake engineering, Anil K. Chopra fills an important niche, explaining the material in an approachable style with his Fifth Edition of Dynamics of Structures: Theory and Applications to Earthquake Engineering . No prior knowledge of structural dynamics is assumed, and the presentation is detailed and integrated enough to make the text suitable for self-study. As a textbook on vibrations and structural dynamics, this book has no competition. The material includes many topics in the theory of structural dynamics, along with applications of this theory to earthquake analysis, response, design, and evaluation of structures, with an emphasis on presenting this often difficult subject in as simple a manner as possible through numerous worked-out illustrative examples. The Fifth Edition includes new sections, figures, and examples, along with relevant updates and revisions.